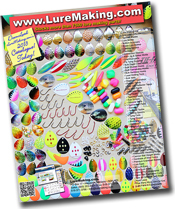 Our Facetted Plastic Beads are available in 4 sizes and 12 colours, all for the lure maker's needs. Facetted beads give that extra glitter fish often need to strike on command. These beads are great for all of your lure making needs. Use on harnesses, spinners, flies, spinnerbaits and all your other lures. All beads are packaged one colour per bag in quantities of 100, 500 or 1000. You may order beads in multiples of 100 in any quantity. Please note that not all bead sizes are available in all colours. 8mm PLASTIC FACETED BEADS - Save up to 70% on size 8 Facetted beads!! The beads listed below are available only in size 10 below. Here is a great way to get a large assortment of plastic beads. 500 beads per pack. Packaged by the size.